Finally! This monkey (well, rat) is off my back! This team has been causing my guilt gland to seep for over 25 years. I bought them and let them lie for years. When I did get started on them, I got part way through and then let them lie again. Then a few years later I did a bit more and then set them aside again. When I next looked at them in decided I liked the red and yellow colour scheme but wasn't satisfied with the work I'd done. So they went into the Dettol and there they sat. But now I have at long last given them the attention they deserve and have taken them to the workbench long enough to actually finish them! This Blood Bowl team has been hanging over my head like a (literal) lead weight for about 25 years. 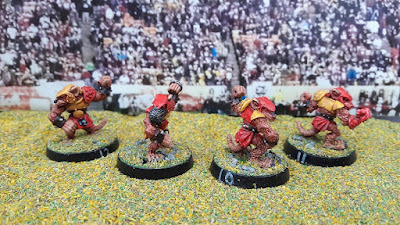 I bought them way back during the 2nd edition of the game (about 25-30 years ago I would guess) and made a small start on them, then got bored, dropped the entire hobby for a while and since getting back into Wargaming about a decade ago have been feeling guilty about not finishing them off. Well, their time has come. I'm working my way through my cupboard of shame, bit-by-bit and now it's come around to these guys. 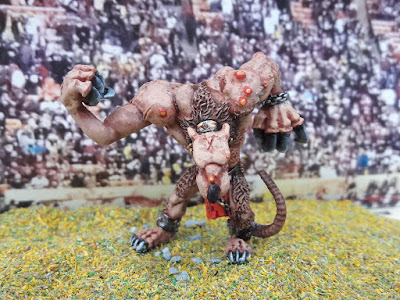 Oddly enough, I've chosen to start with the one model I added to the team most recently, which is a Rat Ogre. 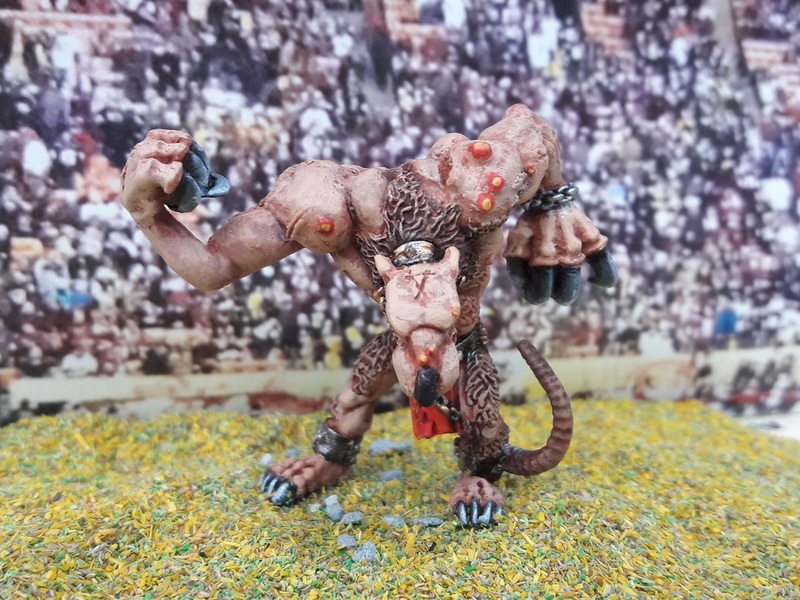 It's not even a Blood Bowl Rat Ogre, but a Warhammer Fantasy Battle model. Near enough, though.